This is my top 5 common household items repurposed in my home. My inspiration comes from an empty parmesan cheese container. I simply could not bring myself to throw it away! However, I simply cannot continue to save empty containers, knowing there is some use for them but not putting them to that use! Can I? Have you done that too? It is spring cleaning season, I am supposed to be purging the closets, drawers and doors. 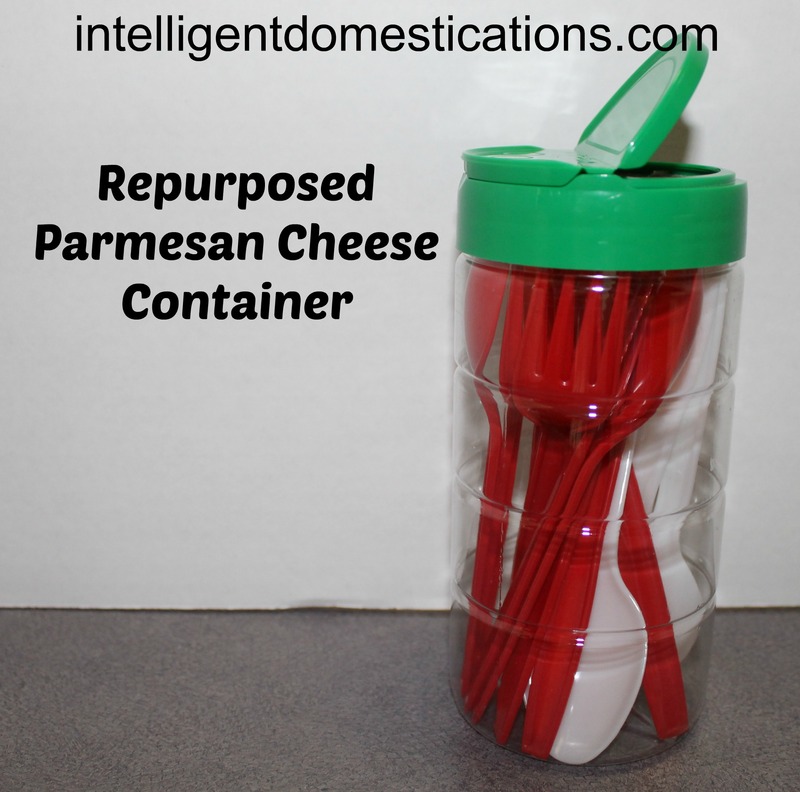 I really like the repurposed parmesan cheese container idea for plastic ware because it is a rigid container protecting it’s contents. You can see through it too! You could of course store anything of your choosing in that container. I like to pack some plastic ware when we go on trips, this container is perfect for that. What would you repurpose the empty parmesan container for? We used to purchase cat food in these nice plastic buckets. They are great for repurposing because they are sturdy, see though, and have a lid and handle! 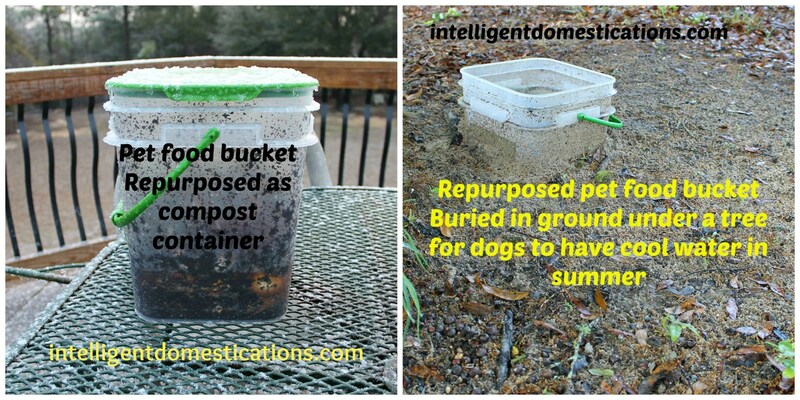 We use them as seen in the pictures for composting and dog water in the yard. We have also used them as storage for seasonal decorations and currently have one serving nicely as a mop bucket. Let me explain the dog water bucket buried in the ground. We live in the deep south where temps commonly reach 100 in the summer. When you couple high temps with lots of humidity, summer can be difficult. In an effort to provide water in various locations around the yard for our dogs, we came up with this idea. The bucket is tall enough to bury with part remaining out of the ground. Our intention was for the dogs to have cooler water during the heat of the summer. It is buried under an oak tree in the front yard. The dogs absolutely love it! There is just no telling how many different uses there may be for repurposing tissue boxes! These are 3 of the ways we have put them to use. The big boxes are great for holding the cat litter scoop. You can just toss it in the garbage and replace it with a ‘new’ box when needed. That beat up box under the bathroom counter has been there for some time holding trash bags. It works like a charm helping with organization. As previously noted with the repurposed pet food container, we like to compost. Did you know that you could add dryer lint to your compost bin? I save the lint in a repurposed tissue box. Learn how to make book markers with empty tissue boxes here. This idea was found on Pinterest a very long time ago. You can repurpose coffee creamer containers in many ways. This is just the one I am doing in my home. I cut the label from the coconut bag and taped it to the repurposed container. I have also used coffee creamer containers for raisins. How have you repurposed coffee creamer containers? This is another Pinterest find. I don’t remember when I even saw this on Pinterest. 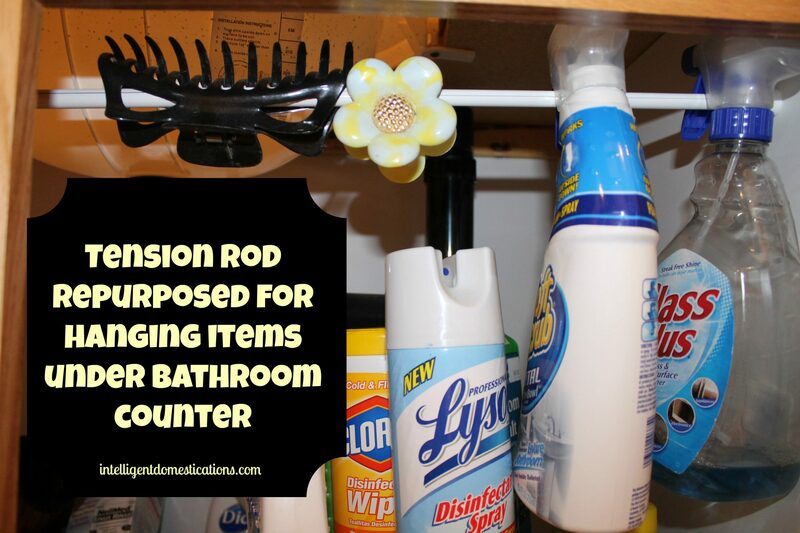 Hanging a tension rod under the bathroom counter does provide a little extra space when needed. A word of caution though, don’t hang anything too heavy unless you have gotten the tension rod good and tight! These are just a few of the most common repurposed items in our household. Please share in the comments what your common repurposed household items are. We all want to know if we could be doing the same! What are your most common repurposed household items? Follow this Blog so you won’t miss anything! These are great! Not only because they are excellent ways to reuse typical items, but mostly because you didn’t overthink and over decorate them! These are great repurpose and reuse ideas! Using tension rod for hanging container is really a good one. Thanks for visiting my blog and leaving comments. I love all these ideas! I think reuse, reuse, recycle is an important thing for us to do. I am pinning these great tips! Thanks for the Pin Amanda! Recycle, Reduce and Reuse are important traits to demonstrate for sure. Thank you for these great ideas!! 😀 I especially love re-purposing coffee creamer containers – they are great for so many things. Thanks, Renee. 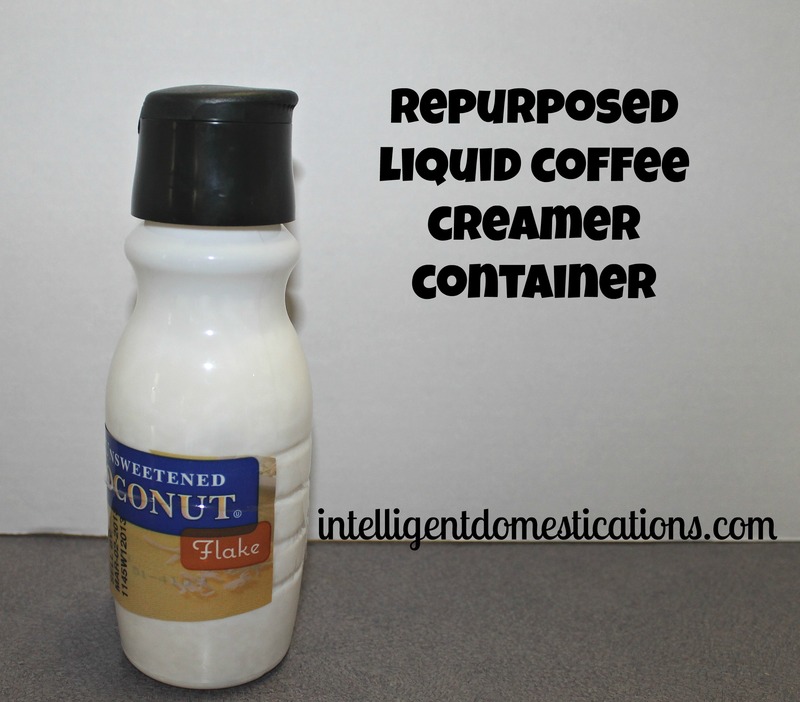 I’d love to hear how you repurpose your coffee creamers! All great ideas, but the dog water in the yard is GENIUS!!! Thanks, Kristen. It get pretty hot down here in the south, as I’m sure you know. We were just trying to find a way for them to have cooler water. Great ideas Shirley! The cat litter scoop ‘holder’ is needed in our house. I love these ideas, especially the tissue box for cat litter scoop. I never would have thought of that and it really does make sense. I too enjoy reusing and repurposing, but now I see that I need to get a bit more creative with it. Thanks, Ricki. I’d love to hear some of the items you repurpose in your home. Thanks for stopping by! I love to reuse and repurpose! Thanks for giving me some new ideas! I especially like the tension rod. Thanks, Alli. There is never enough room under the bathroom counter! The tension rod trick is a great organizational trick.